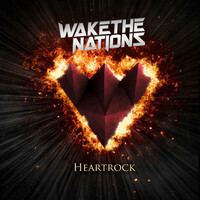 “Heartrock” is WAKE THE NATIONS second album out January 25th, 2019 via AOR Heaven. Which, if you know AOR Heaven, then you pretty much know what to expect. In this case, a whole bunch of kickass tunes by these Finnish gentlemen. “Heartrock” is a diverse AOR album and that is not surprising because WAKE THE NATIONS enlisted help by members of Joe Lynn Turner and Therion. Additionally, production by Ilkka Wirtanen of Reckless Love. Upon listening to “Heartrock”, the listener is immediately thrown into a time warp to the 80’s. 0pener “No Mercy” is a blast from the past with huge 80’s riffs. The keyboards are perfectly balanced. “Tattooed Girl” is a blend of modern hard rock with that 80’s sound. This is the right amount of diversity found on “Heartrock”. WAKE THE NATIONS understand this and wrote a record that is full of memorable songs. “Midnight Lovers” is perhaps the best song on the album. This is the prime example of how a perfect AOR/ melodic hard rock song should sound like. Definitely a must listen. “All My Life” is a ballad that really sends out Asia vibes. Great tune but also benefits by not being too long. “New Day” picks up the pace midway through. There is a great balance of keyboards and heavy, crunchy guitar riffs. Which, again, is the highlight of “Heartrock”. Balance. Things get a little hot with “Flames”. This is a short and sweet number that is on the heavier side. There is an almost Europe-like quality to this song, musically. Also, great idea of including female vocals. This makes the song sound that much better. Want something catchy and memorable? Well take a look at “Something in your Eyes”. This is sure to be a fan favorite and the chunkier parts in the middle are really what set WAKE THE NATIONS apart. Some of the best moments on “Heartrock” come in the middle of songs with some double bass heavy interludes with just as heavy riffs. With that being said, “Higher” is one of the heaviest songs on the album that is also sure to be another fan favorite. However, not every song on “Heartrock” is over the top. Closer “This is Over” has the most modern sound of all the songs. It has many pop elements and sounds a bit out of place because of this. WAKE THE NATIONS have written a great album overall. Very diverse group of sounds. Undoubtedly, “Heartrock” has the classic AOR sound, but with a modern production. Again this is very much a team effort and it shows. It is always a plus to listen to AOR rock with metal tendencies. For fans of Toto, Journey, Europe, Survivor, AOR and melodic hard rock. “Heartrock” is a perfect balance and is good for the heart and soul.